In this love letter to his father, former professional golfer Nathaniel Crosby shares memories of Bing Crosby on the golf course, and the lessons he taught him about the game and about life. With a Foreword by Jack Nicklaus. “Bing Crosby was a great ambassador for our game, as well as a great man,” hails longtime friend and golf partner, Jack Nicklaus. The beloved singer and star was also an extraordinary teacher who instilled an abiding passion and mastery of the game in his youngest son, Nathaniel. Winning the US Amateur at nineteen, Nathaniel went on to compete in high-level professional tournaments for his entire life. In 18 Holes with Bing, Nathaniel introduces us to the Bing Crosby he and his family knew—not the beloved singer who played golf, but a golfer who sang to pay his country club dues. Nathaniel shares exclusive stories about this American icon golfing, working, and playing with some of the most famous people in history—royalty, titans of industry, stars of stage and screen, and champions of the green, including Bob Hope, Dwight Eisenhower, Ben Hogan, Jack Nicklaus, and Louis Armstrong. At the book’s heart is an intimate account of a father and a son—how a mutual love of golf formed an exceptional emotional bond. Full of anecdotes, vignettes, and recollections of Bing’s time on the course, the tournaments he created and later sponsored, and the constant encouragement he showed his son, 18 Holes with Bing honors this celebrated golfer, entertainer, and father, and illuminates his life as never before. 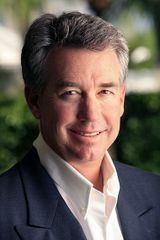 Nathaniel Crosby won the United States Amateur Championship in 1981, is a former European Tour player, and was host of the Bing Crosby National Pro-Am for eight years. He played in three Masters, the United States Open, two British Opens, and on winning World Amateur and Walker Cup teams. He is the former president of Toney Penna Golf and grew two major golf manufacturing companies, Nicklaus Golf Equipment Company and Orlimar Golf, to substantial levels. He is currently the founder and president of AppleTree Management Group, the managing company of AppleTree Golf Society that is coordinating thirty private golf clubs into an ultra-affluent golf membership program. He lives in Jupiter, Florida with his wife, Sheila, and their six children.